4th of July Appetizer or Anytime Snack: Who’s Up for a Quail Egg Slider? Inspired by food truck fare, bar menus and backyard grills everywhere, these miniature burgers are the perfect summertime hors d’oeuvre. Here in Mongolia, it can be tough to find the ingredients we’re looking for. Seafood? Forget it. And if we hadn’t smuggled in… er, I mean brought with us a full collection of spices, we’d be scrambling to find much of anything past pepper, paprika, cinnamon and coriander. Interestingly enough though, fresh quail eggs are easy to come by. Thus, the wheels of invention start spinning. Tossing an egg on top of a sandwich is a time-honored tradition. And sliders – those miniature hamburgers served as an appetizer or traditionally in sets of three as a main entrée – have been around for decades. But this dressed up version of a classic sandwich, complete with thick bacon, a chipotle-and-soy-sauce seasoned patty, swiss cheese, a nice, big sautéed mushroom cap and topped with a perfectly fried sunny-side-up quail egg brings things up a notch. As for the quail eggs themselves, they’re loaded with nutrition – research has put them at three to four times the nutritional value of typical chicken eggs. But with comparatively large yolks and shells lined with a tough membrane, they can be tricky to work with. Crack the eggshell on a sharp edge such as the side of your frying pan, then, taking care not to break the yolk, use a small knife to cut the egg open. Cook these eggs at a lower temperature than you would cook a chicken egg; they’ll still cook faster. For terrific Potato Salad options to serve with these sliders, see: Pennsylvania German Potato Salad or Roasted Potato and Caramelized Onion Salad. Place mushroom caps in a bowl. Toss with a little olive oil and some smoked sea salt and black pepper. Set aside. Fry bacon in a frying pan. Drain on paper towels and set aside. Keep some of the bacon grease. Add a little olive oil to the pan along with reserved bacon grease. Heat over medium heat till sizzling hot. Add the patties to the hot pan. Cook for 2 minutes to get a good sear on one side. Flip, lower the heat a little, place the slices of Swiss cheese on top of the patties and cook for 3 additional minutes. Remove to a plate covered with a paper towel to drain. Cover plate with a pan lid or place in warm oven to keep warm. Save all or some of the grease in the pan. Add the mushroom caps to the hot pan. Add additional olive oil if necessary. Sauté mushrooms until they begin to soften, but don’t overcook. You want them to retain some firmness. Remove and drain on paper towels. Meanwhile, as you’re cooking the patties, sautéing the mushrooms and so forth, slice and toast the buns open side down in a pan with a little hot oil. Spread with mustard. Add a tablespoon of olive oil to a clean, non-stick frying pan. Over medium-low heat, bring the oil to cooking temperature. Carefully crack the quail eggs and add them to the pan. The whites should begin cooking slowly, but these eggs are so small that even on low heat, they’ll be completely done in about three minutes. 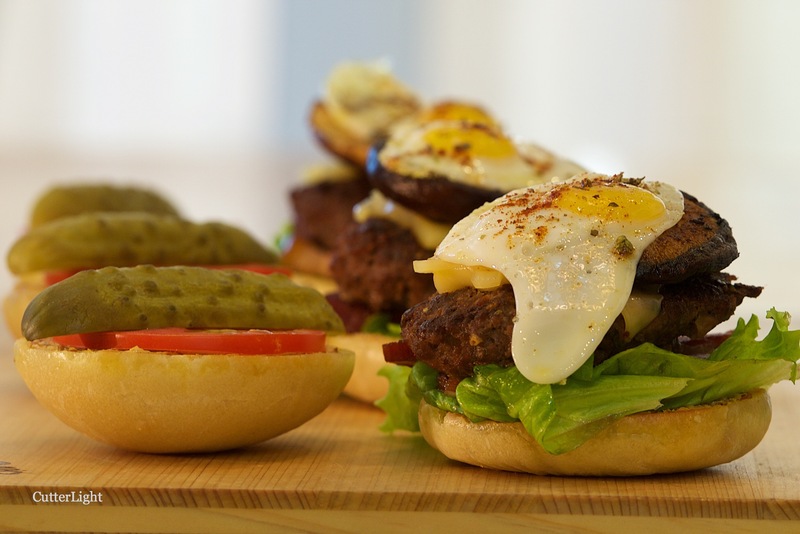 Meanwhile, start building your sliders: bun, mustard, lettuce, bacon, burger with cheese, mushroom cap, sunny-side-up quail egg. Add a pinch of chipotle seasoning to the eggs and serve sliders open-face with a pickle, a slice of tomato, and Pennsylvania Potato Salad or Roasted Potato and Caramelized Onion Salad. Yes, Mongolia. Not exactly the food capital of the world, but the challenges here are leading to creativity. An example of our days here would be this: we had the worst pulled pork sandwich of our lives for lunch at a local restaurant. In fact, the only bad pulled pork we’ve ever had. We came home, and for dinner created a gnocchi recipe that came out wonderfully and happened onto a $10 bottle of Spanish chardonnay (another first) that paired beautifully with it. We’ll post the gnocchi recipe soon. And by the way, after considerable hiking around the city, we found a good whole chicken and olives to give a try at a recipe you recently posted. Happy dining! Oh my! How can anyone ruin pulled pork?!!!! You live very interesting lives.